G-Man told me he would be drinking at Fraktal until 6 p.m., and then he’d be free for dinner. 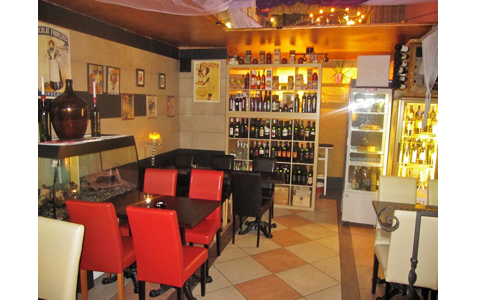 Of course, they do a good burger there, but I saw my opportunity to finally try an Italian place just down the street on Šmeralova. He said that sounded fine, so we met at Fraktal and walked over. The street-level entrance by the front door has a few tables, but I’d only eat there as a last resort. 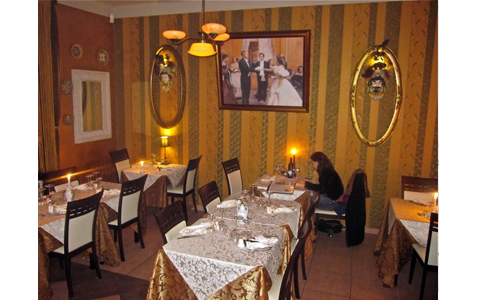 The downstairs is a much more eye-grabbing proposition, with gold and white table cloths, gold picture frames, and busy, patterned wallpaper. In Italian, it means “The Leopard,” It’s the story of a prince and his efforts to preserve his family and position during the wild 1860’s Sicily. This is appropriate because Il Gattopardo is not just Italian. It is proudly Sicilian. And this is where most of their wines are from. And the most important red grape from the island is the Nero d’Avola. 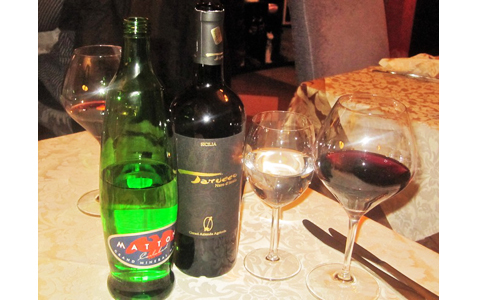 We ordered a bottle made with them from Tarucco (370 CZK). The smooth, drinkable wine was a great buy. We also got a big bottle of Mattoni (80 CZK) to go with it. It sounded like a simple snack, but we were both surprised how much we loved it. The secret was the so-called pâté. I asked our waiter what the creamy spread on top of the crunchy toast was made from. He told me it was mascarpone cheese. While I didn’t taste a lot of pistachio, there was the hint of good olive oil. Our waiter brought out a plate of pasta we could choose from and described each one in detail. He was super helpful and patient throughout the meal. When we were talking about Sicily, he almost sounded apologetic that he was from Sorrento. 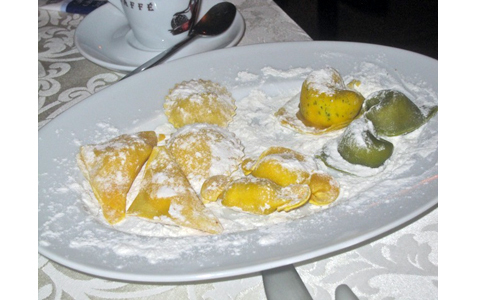 G-Man got a special pasta called “fazzoletti” (220 CZK) which translates as tissue paper. It is folded into pockets which our waiter said were filled with chopped king prawns, mussels, and clams. Even though I expected more seafood flavor, we were both amazed both by the taste and texture of this fresh pasta. 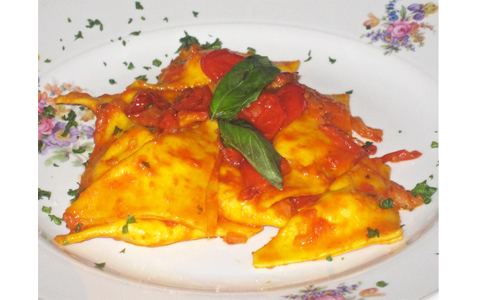 Also, the simple sauce was bursting with the essence of the best fresh tomatoes and basil. I ordered the Pasta di Don Totucci (220 CZK) from the regular menu. The waiter told me the pasta type would be decided by the kitchen at the last moment. On this night, it was rigatoni. 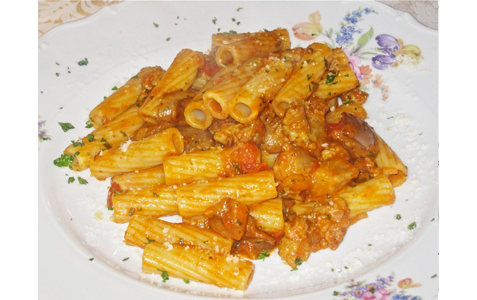 It came with excellent, anise-accented Italian sausage, diced eggplant, and mushrooms in tomato sauce. While very good, we both preferred G-Man’s selection, hands down. For dessert, I got the chocolate “soufflé” (120 CZK). It was really more of a fondant soaked with intense chocolate syrup. 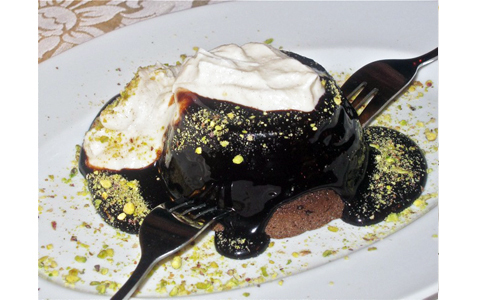 What really made it special was the topping of creamy, tangy mascarpone cheese and a sprinkling of pistachio. It was eye-rolling goodness. I’ll make an observation about the music. 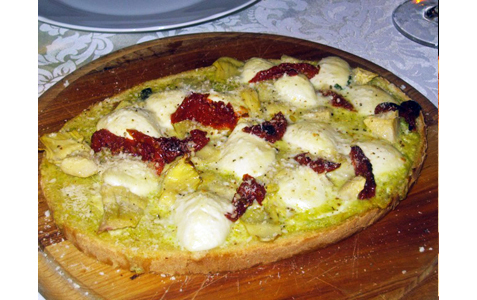 It is Sicilian and selected by the waiters. But to my ears, some of it sounded corny and odd, with one song sounding like Alvin and the Chipmunks. The bill for this visit was 1360 CZK, before tip. 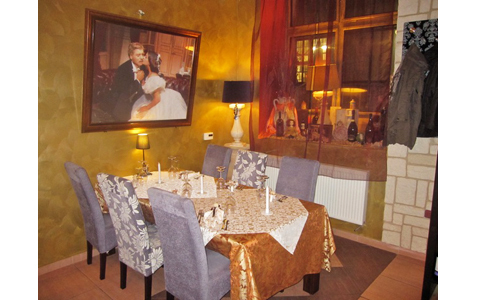 Along with the wine, the price included a cover charge of 30 CZK each. I was so impressed, I went back again with J a few days later. First, I wanted to try something the waiter said was very popular, so we shared the Bruschettone Don Sedara (180 CZK). 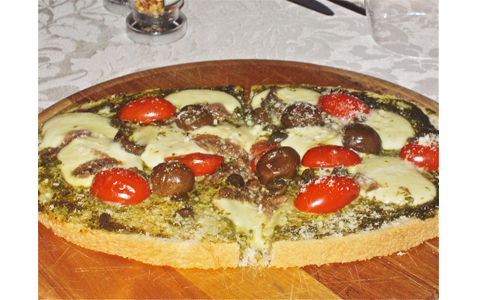 This was topped with buffalo mozzarella, cherry tomatoes, anchovies, olives, and capers. It also had a creamy base. It was much too salty for my taste. I couldn’t conceive of eating the whole thing myself. I much preferred the bruschettone from the previous visit. I was so curious about the menus many offerings that I went a little crazy ordered the Degustace Vévody z Palma or the tasting of the Duke of Palma (360 CZK per person/minimum two persons). It consists of six dishes. I’ll list them in the order that I liked them. 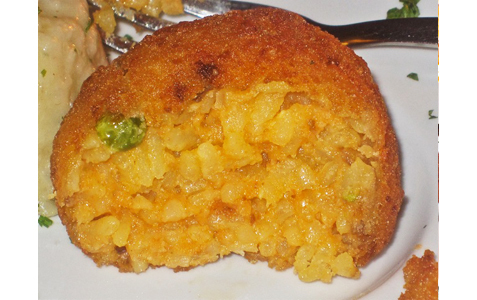 First, there was the arancini or fried rice balls. They were beautifully crisp and filled with creamy rice. The filling was somewhat bland. 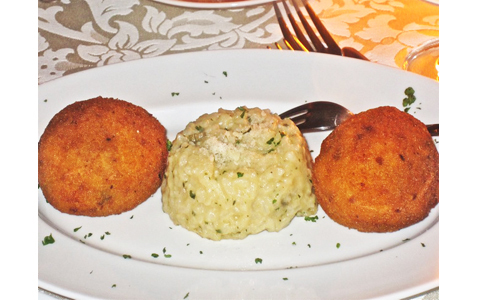 But the risotto between the two balls was just amazing. I told the waiter I tasted lemon and wine. 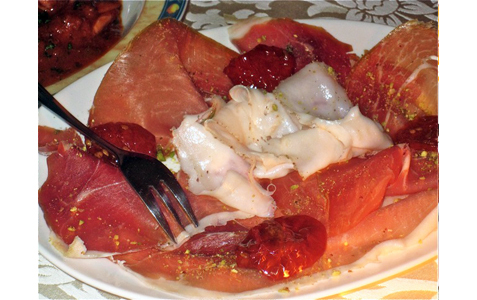 We had a plate of fresh Italian ham and sun-dried tomatoes with a pile of Lardo di Colonatta. Yes, the white stuff is pure pork fat all the way from the Apuan Alps. When you place it on your tongue, it dissolves almost instantly, leaving a wonderful nutty flavor in its place. 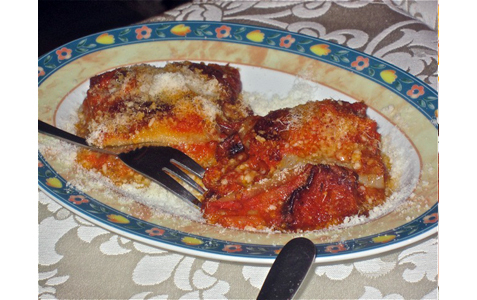 The eggplant parmesan included the very good tomato sauce and grated parmesan. 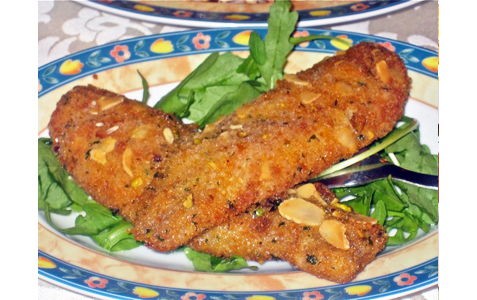 The fried sardine filets, coated with bread crumbs and almond slices, were crunchy and tender. 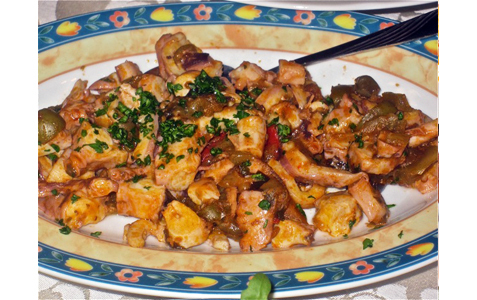 The chopped octopus was just OK, with the strong flavor of olives. 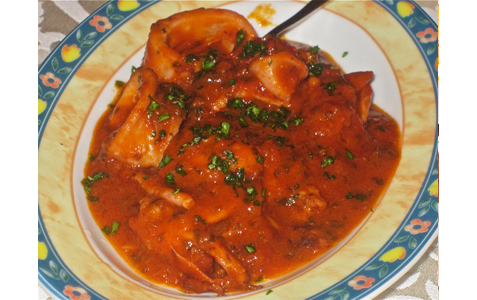 The calamari in tomato sauce was slightly rubbery and had a very strong, fishy flavor I didn’t really like. The last three dishes were barely warm. I wished they had a little more heat. My curiosity was really out of control at the beginning of the meal. 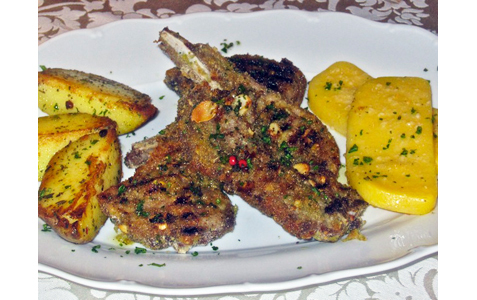 I also ordered the lamb chops (320 CZK). I had a long conversation with the waiter about how I liked my lamb medium-rare. But I had a feeling it would be for naught. The four, thin, but large chops came cooked all the way through. They were coated with extremely buttery bread crumbs mixed with a little pistachio. They were tender and tasty, but I’d hoped for something a little better for the money. On the side were decent roasted potatoes, and excellent, delicate, corny polenta. Of course, this was way too much food. I ended up taking half the bruschettone and two of the lamb chops home to eat for lunch the next day. The bill for this huge meal was 1265 CZK before tip. 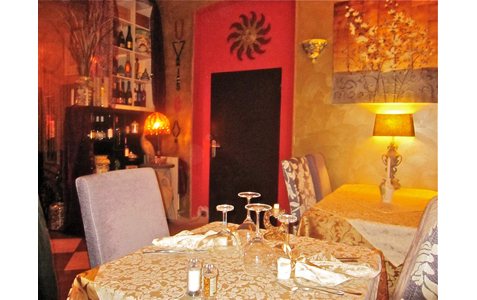 While I enjoyed my second visit less than my first, I remained impressed with some of Il Gattopardo’s straightforward, authentic Sicilian dishes, its pleasant dining room, and our charming waiter. 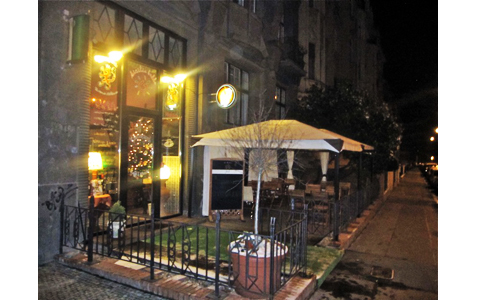 If you are looking for the taste of real Italian pasta, it’s one of the best places in the city.